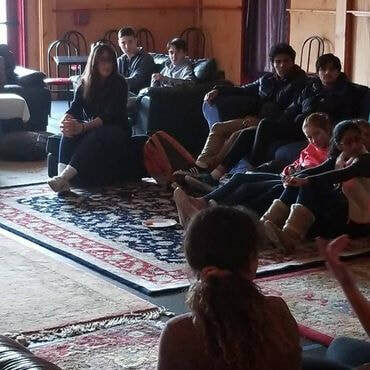 Trackside supports Wilton teens by providing them a place within the community, other than home and school, where they can be involved in healthy socialization and gain experience in participating as a citizen in a productive manner. Trackside exists as a safe zone where teens can build social relationships and have fun in a safe, alcohol and drug free environment. Since Trackside’s motto is “For the Teens, By the Teens,” we rely on teen support and suggestions for all our programming. This is where SGB comes in. The SGB at Trackside functions as one of our links to the teen community. Members of the SGB serve as the representation of their peers, voicing ideas for fun, safe, and socially beneficial events as well as working on the logistics to implement those events. While serving as positive role models for the Middle School SGB, High School SGB members will focus on creating, implementing, and promoting special events for high school students. Past special events have included concerts, trips, movie nights, dances and parties. Trackside hosts Middle School Parties throughout the school year. Middle School SGB members will work together to decide on Friday theme party activities and help with promotion at Middlebrook. Middle School SGB members will also suggest new ideas for clubs and classes. The SGB will meet twice a month during the school year at Trackside. High School SGB meetings will generally be Mondays from 5 pm to 6 pm every other week. Middle school SGB meetings will generally be Mondays from 3:30 pm to 4:30 pm every other week. Check our calendar on the HOME page for our listed meetings. Students who have not registered but are curious about joining the SGB are always welcome to attend. Bring a friend! Please fill out all fields. Type "N/A" or "none" instead of leaving a field blank. A blank field will prevent your form from being submitted. Yes, Trackside may include me/my student in photos. No, Trackside may not include me/my student in photos. Click here to read the SGB charter.